Aicok is kind of like the new kid on the block when it comes to kitchen appliances, but they have already built up a reputation for creating efficient and quality products. While most people might be skeptical about trying out a new brand, we have searched for advice and listened to experts in order give you a quality review of these products and you will not need to worry about testing out the product and you will have peace of mind when purchasing the coffee maker. 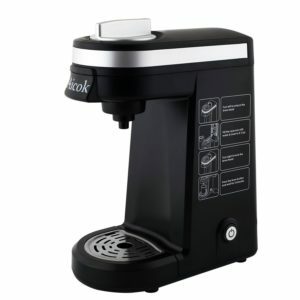 Not all coffee makers are the same and Aicok has come up with a few fresh and unique designs at really affordable prices. These coffee makers are designed for high-quality products and you can have peace of mind, knowing that every cup of coffee will be perfectly brewed and have the same quality taste as many of the more established brands. 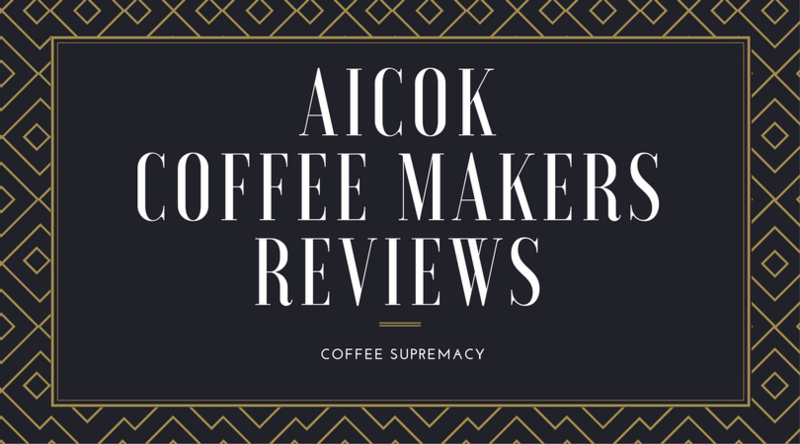 Before we check out Aicok coffee makers, there are a few features that you need to be aware off to be sure that you are buying a quality product. These features can be used as a method of checking the quality of other coffee makers as well. Design: Having a coffee maker that has been uniquely designed will definitely assert some level of style to the people that are visiting you. If the coffee maker looks good and special, people generally think that the coffee will also be better and this gives you that added edge when entertaining guests. Dispensable amount: The amount that can be dispensed from the coffee maker is also essential and this will ensure that you do not have to refill and make coffee multiple times. You will be able to make enough coffee for all of your guests in one go. BPA Free: This is essential and highly recommended by most coffee experts. Not only will it affect your own health, but it will also affect the taste of the coffee. The effect is very subtle and if you are not used to having a BPA free coffee maker, you might not even notice the difference. We highly recommend ensuring that it has been cleared as BPA-free by the FDA to ensure that you have quality . Usability: You should be able to easily master the programs of the coffee maker and if it does not have multiple programs, we recommend looking for a one-touch feature in the coffee maker. This might be for lazy people but it is much more effective . Cleaning: You should take notice of how the product needs to be cleaned. This could range from disassembling the parts and putting them in the dishwasher to adding water and turning on the self-cleaning feature. The self-cleaning feature might be a little more expensive, but it is definitely worth the effort. By taking these 5 features into account, you will be able to make the right choice and ensure that you have a quality product. Newer coffee makers might be cheaper, but this does not mean that they lack in quality and you will be able to use the key feature guide to ensure that you pick a product that does not lack in quality. With that being said, let’s look at the 3 coffee makers designed by Aicok and how they could benefit your life. 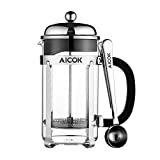 The Aicok single serve coffee maker that use K-cups is the perfect addition to the homes of bachelors or people living with a partner that does not always love coffee. The coffee maker is only able to dispense one serving at a time and this could be frustrating to some people. We recommend buying the added K-cup along with the coffee maker as it will allow you to take the coffee on the road and give you a portable way of drinking the coffee. The coffee maker also features one-touch controls and the boiling process only takes 2 minutes to fully boil 12 ounces of water. This will save you a lot of time and with the affordable price of the coffee maker, you will be able to have a perfectly brewed cup every morning. The coffee maker is very small in size and this means that you will have the capabilities of carrying it around with you. This will greatly benefit coffee addicts in the office and you no longer have to rely on the coffee made at work. Simply plug in and you could start brewing. It is recommended that you brew clean water after prolonged periods of use to try and clean the coffee filter. You might need to do this multiple times to ensure that you have it clean and unfortunately, not all of the parts can be removed. The coffee maker has also been approved by the FDA to be BPA free and this will increase the quality of your coffee. We highly recommend this coffee maker to travelers and you will be able to take this on holiday as well. 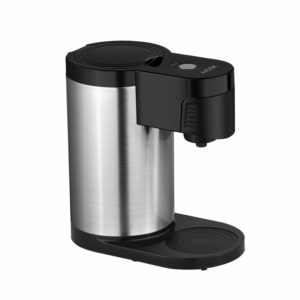 You will only need to add the water and the coffee and you will be able to brew your own coffee on the go. 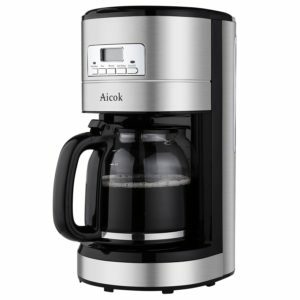 The larger Aicok 12 cup coffee maker will be a great addition to your kitchen if you like entertaining guests or if you like to make one large cup of coffee for the whole day. The glass carafe has already been included when you purchase the product and this will allow you to brew one large serving for the entire family. The mesh filters are not that expensive and even though you will receive one that has already been included, this will need to be replaced and washed over time to ensure that excess coffee does not build up and block the filter. Furthermore, the coffee maker has an added 30 second anti-drip feature to allow you to remove the jug without causing any mess or spillages and the entire coffee maker is operated by an onboard which has a built-in LED light to allow you to even use the coffee maker without turning on the lights and waking everyone. 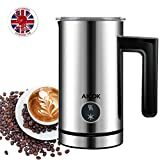 Featuring a stainless steel body, this coffee maker has just recently been released by Aicok and it is a lot smaller and more durable than many of its predecessors. The K-cup design has been carefully designed to allow for multiple cup sizes and the boiling process only takes up to 2 minutes to ensure that you have a fast and well-tasting cup of coffee. The coffee maker also features a one-touch design that will allow you to easily brew a cup of coffee and once you are done, the coffee maker will automatically shut down. The water reservoir is much larger than competitor portable coffee makers and you will be able to fill it once for about 2 days’ worth’ of coffee, depending on the amount of coffee you drink. Furthermore, the coffee maker also features a built-in energy saver computer that will shut off when the product is not in use. The components can also easily be removed and they will need to be hand washed, but this will ensure that they are clean once you wash them. 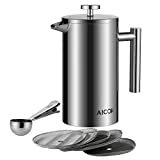 We highly recommend this Aicok coffee maker for portable use and you will be able to easily fit the coffee maker in a backpack and carry it along. The coffee maker is great for carrying to and from the office to ensure you have your own top quality coffee. If you need great and cheap milk frother you need to check Aicok model. Like all Aicok product this inexpensive and excellent electric milk steamer. This frother have 5.00 rating on Amazon and that rating you can not find for other milk frothers. Best of all is that price is lower than most other milk frothers. We would like to thank you for reading this article and we would also like to encourage you to ask questions if you are unsure about coffee makers and we will do our best to help you make the perfect choice. Does Aicok make a pod so you can add your own coffee? No, but you can use any reusable single cup Keurig filter for your favorite ground coffee.